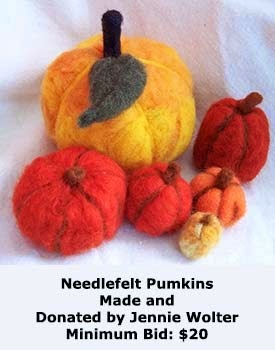 Auction of Stitch Items Online! 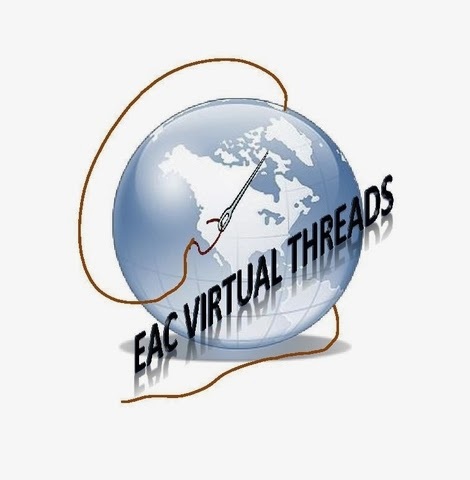 I have been a bad blogger - still working like heck on my garden every waking hour instead - but wanted to let you know about this auction online right now by Embroiderers' Association of Canada. 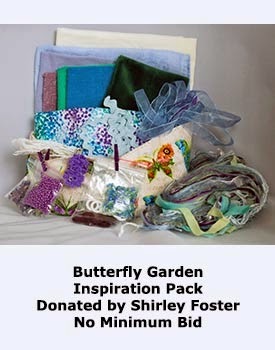 There is even a stash package (above) that would be great for crazy quilting! 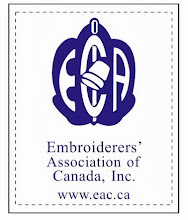 I have one item in there I hope will bring in a few dollars for EAC. You can see the details on the photo above. 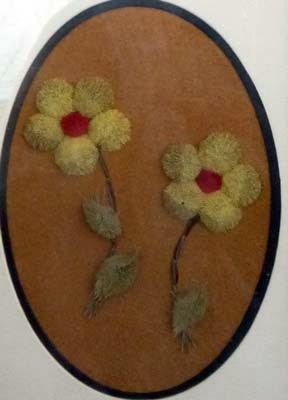 It is a piece of vintage caribou hair tufting, a Canadian First Nations fibre art form. 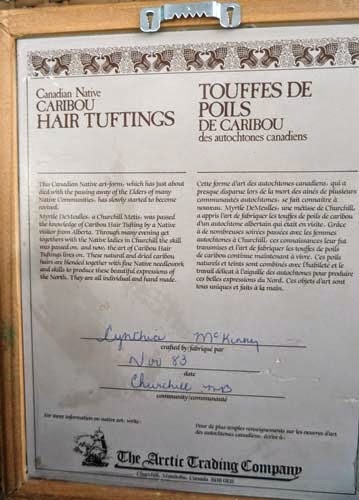 This piece is still in its original frame with the documentation on the back from The Arctic Trading Company. Pretty neat stuff! 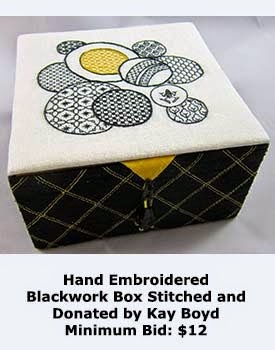 A piece of history for your fibre art collection! And it is going for a bargain price as well! Here are a couple more samples of what is up for bid. There are lots of other items too - you will have to check it out at the auction. Don't delay though - bidding closes on June 29th! I try to keep the subject of my blog to stitching and not delve too often into other things but this was too neat not to share, even though I posted about gardening last time. I was weeding the badly neglected flower bed today and found a nest in the potentilla bush.which in itself was kind of amazing since it is only about a foot off the ground! Look closer through and you will see three robins eggs and two cowbird eggs. Cowbirds are a common prairie bird of medium size, black with brown heads, and are nest parasites. They lay their eggs in another bird's nest and leave them for the unsuspecting bird, in this case a robin, to raise, often with disastrous results for the nesting birds and their offspring. I knew about this phenomenon but I had never seen it for myself before and it was such a neat find I had to share it. Nature works in mysterious ways! Why Haven't I Been Stitching? 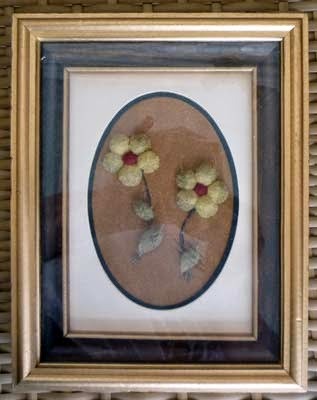 I haven't stitched or posted in a week and it is because with it being spring and all, I have been out in the garden. Actually, with having worked away the last seven years for the four summer months each year, the garden has gone to rack and ruin! My poor husband had so much on his plate with me away and the long work hours the warm weather brings, most of the garden had come completely to grass and weeds - some of which were taller than me! My tomato and pepper plants are in now and happy in their spot. I have managed to get quite a bit of the garden rototilled and raked so far. My husband has built some new frames for some of the beds. Bringing a garden back from the edge like this is almost like starting a new garden entirely and it has the same excitement. Some of the permanent plants, like the Saskatoon berries and the asparagus bed survived but just need some TLC to bring them back to health. The rhubarb plant actually died - I didn't think it was possible to kill a rhubarb! My strawberry patch was choked out by grass and needs to be replanted and I want to get a new rhubarb and some raspberry canes in as well. Sadly enough, this is my asparagus patch. These are my poor neglected Saskatoon bushes. Believe it or not, this used to be a nice productive strawberry patch! Once the veggie garden is all brought back to life, I can start on the flowers. To show you how much work I have ahead of me, this was a lovely flower bed, full of perennials - columbines, lilies, delphinium, etc. So much to do! !